By adding a bit of warmth, a fire pit allows you to extend the hours you entertain. Do you love entertaining in the summer? Do you have an outdoor space that is ideal for an evening of fun with family and friends? Creating the perfect patio space can make all the difference. But what makes a patio great for entertaining guests? We have a few tips to help you create a dream entertainment space that will have everyone dropping in. When designing your patio, we keep conversation areas in mind. Incorporating a large open area allows guests to mingle together, and landscaping can also provide intimate spaces throughout your patio. With a comfortable area that offers plenty of seating options, your guests will be able to relax and unwind. Fire Pits are a great feature when it comes to entertaining, provided building codes or permits allow this feature in your area. When you add a fire pit to a patio, it gives guests a place to sit and warm up after a dip in the pool, or enjoy the breeze. There are various ways you can incorporate a fire pit in your patio space to encourage conversation among guests, and on a cool evening, a fire pit allows you to extend the hours you entertain. Safety should be of primary concern when entertaining. No one wants to end the night in the ER due to a terrible fall or slip. Good landscape lighting can prevent this. 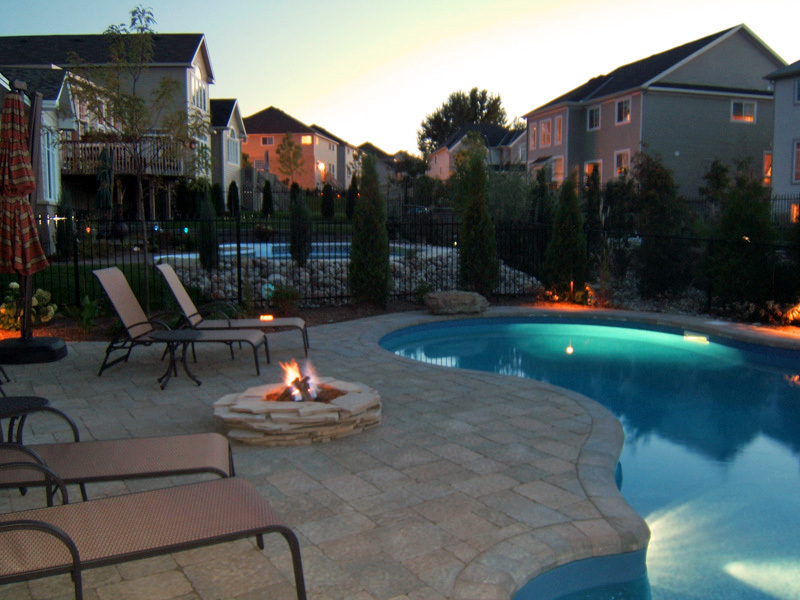 Adding lighting throughout your landscape and within your pool can reduce injuries, as well as add ambiance. This way, guests can feel comfortable late into the night. Plants and flowers around your patio can provide shade and privacy. You can use different kinds of plants and trees to create a unique design. Be sure that your landscaping is easy to care for and will not create extra work when it comes to cleaning your outdoor space. Guests enjoy lush green areas but don’t enjoy having to pick leaves and seeds out of the pool. If you are looking to create the perfect outdoor entertaining space for your home, contact the experts at Ottawa Home and Garden. We can help you design the perfect outdoor entertaining space that will help you create memories that last a lifetime!